Ship owners have gone back to the scrapyards over the past couple of weeks, selling more overaged tonnage, in a bid to compensate for the newbuildings entering the global fleet in an already overburdened market. In its latest weekly report, Clarkson Platou Hellas commented that “the market has shown some strong signs of recovery following the reduced buying appetite and lack of tonnage during the summer months with all three Indian Sub-continent markets finally looking evenly balanced creating healthy competition. 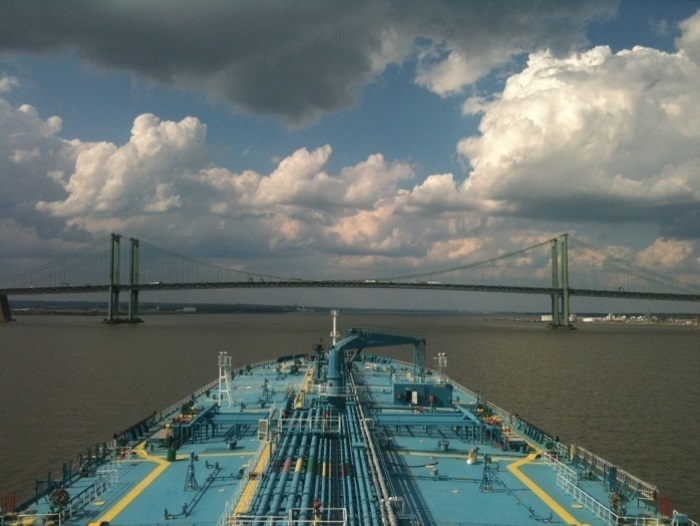 This has been evidenced by the amount of various types of units that are under the spotlight this week in addition to another high profile VLCC sale, which could possibly prick Owners ears up. With Pakistan now fully operational again in their dismantling process, the larger Tanker units will once again see interesting numbers, as seen below, however the large quantity of bunkers RoB should be well noted, as this is a main contributor to the impressive price”, said the shipbroker. It added that “however the main concern has been from India where the rupee hit record lows of Rs72 against the US Dollar and has fallen about 6% in the last month and about 10% in the last three months. But the promising news is generally the country economic outlook looks stable with strong GDP growth and local steel markets remaining firm and positive. It is hoped the currency troubles do not deter the ship recyclers from re-discovering there aggressive buying form as we approach the last quarter of the year which is often the strongest time for shipping markets, with more larger wet tonnage anticipated to hit the recycling industry”, Clarkson Platou Hellas concluded. Meanwhile, in a separate report, Allied Shipbroking noted that it was “another week with limited activity to note in the ship recycling market, with just a handful of units concluded for demolition over the past few days. There is still a feel that appetite amongst breakers is still at limited levels despite the prevailing price levels being noted. The limited flow of demo candidates has played its part in keeping things level, though with expectations now for a re-firming flow of candidates to emerge things could start to get more competitive as we move forward. There are however other important factors feeding this clampdown of late. First of all, dry bulk sector is almost absent in the year so far in terms of activity, a sector which has played a big part in feeding volume over the past couple of years. Given the prevailing state of earnings and this trend is likely to hold in the short run at least. As such things have largely depended on the tanker sector, which has already hit a 5-year high in terms of number of vessels sent to be scrapped”. In its latest report, GMS, the world’s leading cash buyer said that “markets are precariously poised at present, with the depreciating Indian Rupee & volatile local steel plate prices bringing grave concern to Alang Buyers, while news of a ‘mini’ budget with a potentially negative outcome for Gadani’s ship recycling sector has started filtering through from Pakistan. 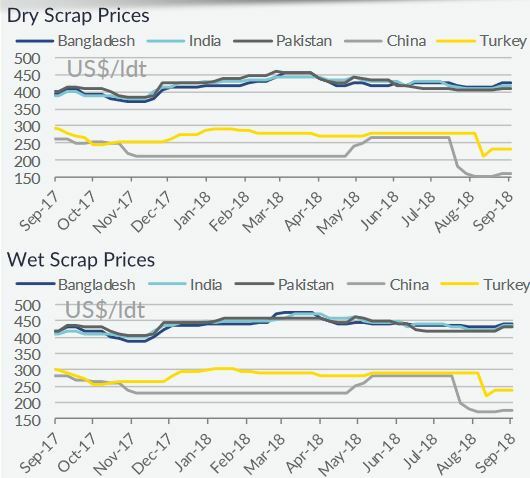 Moreover, both Bangladesh and Pakistan (since Gadani reopened for Tankers towards the end of April) remain stuffed with several large LDT Aframax / Suezmax / VLCCs that have been beached here over the last several months and this has led to a muted degree of demand from these markets over the monsoon season. Cutting permissions too have only recently been issued for the first batch of tankers delivered in Pakistan, while all of the wet units delivered here have sat idly on local yards ever since, waiting for re-inspections and the issuance of gas free certificates from the relevant departments. It is therefore expected to take a few months before some of that inventory starts to shift from local yards and demand returns to previous levels, despite a minimal number of arrivals and beachings through August and an empty port report in Gadani for the third running week. With the Indian Rupee trading over Rs. 72 against the U.S. Dollar (in unprecedented and historical lows), it has been a curiously tentative week with many end Buyers not expecting market improvements to the same extent that some bullish Cash Buyers are pricing some of their offers / acquisitions that resulted in another VLCC and a Capesize bulker being fixed at some extremely speculative numbers this week. At the far ends and as has been the case for several weeks, now, Turkey and (especially) China remain non-players in the recycling industry”, GMS concluded. Nikos Roussanoglou, Hellenic Shipping News Worldwide. Published On September 13th,2018 @ www.seajobhunt.com !! !